By the fourth and final day of San Diego Comic Con word had gotten out that to get a seat in Hall H one must camp out in line hours before the panels begin. And with no panels in Ballroom, Hall H was the biggest stage for Sunday. I was up and in line by 3am and still ended up waiting down by the marina behind the convention center. Why was I so committed to Hall H after four long days? The Doctor Who cast was appearing in Hall H and talking about the 50th anniversary season starting this Fall (plus I have a huge crush on Karen Gillian). And after a few panels I set out to explore the exhibit hall and Gaslamp Quarter one last time before ending another amazing weekend at San Diego Comic Con. Hall H Programming was jam-packed for the last day and so was the crowd. Upon entering the room, fans were given a grey fedora hat to promote the final season of Fox’s FRINGE, which was also the first panel of the morning. The cast of FRINGE took to the stage to talk about their final season and how much working on the show has meant to them. There were tears and laughs as favorite moments on set were shared and which scenes were the most moving were discussed. The new season will start off one day after the last season’s finale and will take place in the future. When Doctor Who finally took the stage fans were in an uproar. Many had been waiting in lines since the night before and were eager to hear about all the changes coming in this big 50th anniversary season. It is already well known that the time traveling Doctor will be losing his two current companions, Amy and Rory Pond (played by Karen Gillian and Arthur Darvill respectively), and gaining a new companion midway through the season. Also rumored is that the current Doctor, Matt Smith, will be finishing his term as the lead character at the end of the season. Show runner, Steven Moffat brought little details to the answers fans sought, only that the “Fall of the Ponds” will be touching and HUGE. There was no confirmation about Smith’s tenure on the show. 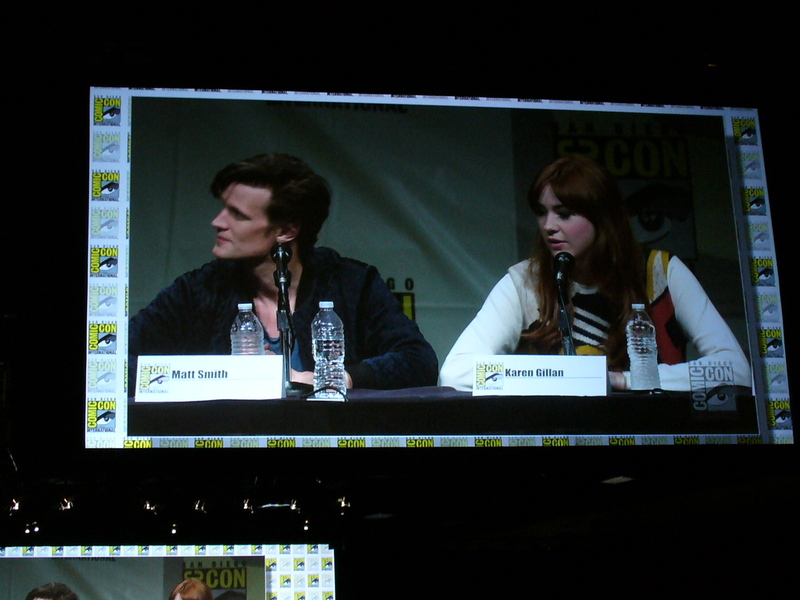 The audience was treated to a preview of an anticipated episode where the Doctor and the Ponds head to the Old West and what appeared to be the first episode of the season titled “Dinosaurs on a spaceship.” The latter episode’s title is literal as the Doctor must deal with dinosaurs…on a spaceship…hurtling toward Earth. While fans did not get all the answers they were hoping for, we all left the panel very excited for the new season. And when I say left, I mean the crowds (including myself and Con Safety Buddy Guy) filed out of Hall H after the Doctor Who panel to make room for the thousands more fans waiting to get into the Sons of Anarchy panel. Did I mention I have a crush on her? After sitting down for awhile, I was ready to stretch my legs and explore the exhibit hall floor. I stopped to visit Joel Gomez and Beth Sotelo both amazing comic artists to talk about their weekend in San Diego and where they will be headed next. I was also able to pick up a couple prints from Artist’s Alley. I then made my way to the Warner Bros. booth to try and get my hands on one of the super popular Man of Steel tshirts promoting next summer’s big movie, but failed and ended up with a MAD magazine shirt instead. From there I went by to see what other SWAG was still being handed out and see if I had missed any con exclusives to purchase before leaving the convention center. All in all, I filled a bag with goodies and exclusives to keep me busy until next year’s San Diego Comic Con. Ready to “call it a Con,” I met up with Con Safety Buddy Jose in the Gaslamp to check out the outside venues for more pictures, SWAG, and exploration. The biggest stop we made was at the NerdMachine.com’s Nerd HQ where they had taken over a two story warehouse and created a place for nerds away from the Con. 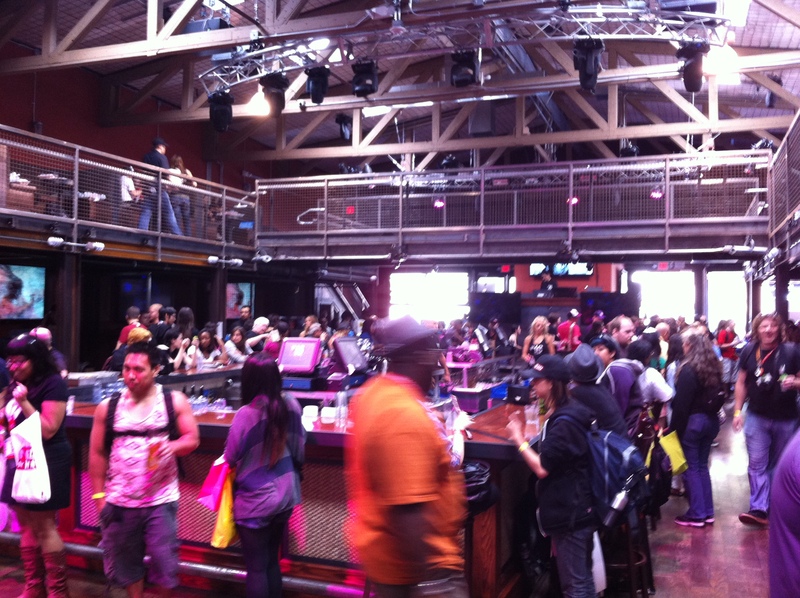 There were Xbox’s for fans to play, a bar, a store and in the previous days, panels featuring some of the biggest names in pop culture. This was surely a “home away from Con” for attendees and nerds who were not able to get passes. I hung out at last year’s Nerd HQ and this year was a much bigger location, very cool project by The Nerd Machine and I am hoping their $20 tickets for their panels raised even more money for the charity, Operation Smile (official totals are not available yet). Nerd Machine has already announced that they will be back next year, so if you head out to San Diego (with a badge or not) head over to Nerd HQ for a good time. Jose got to go by the Yahoo! Movieland shop and get his picture loaded into scenes from Expendables 2, ParaNorman, and Total Recall. 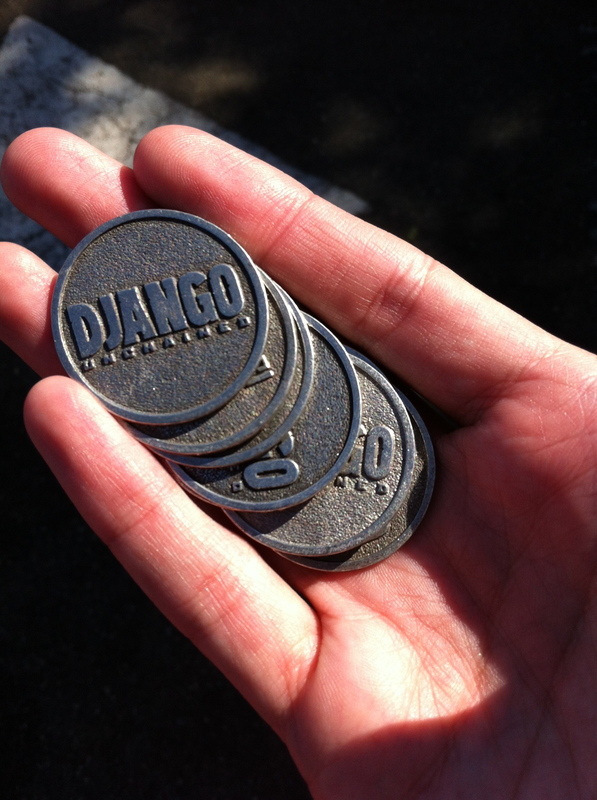 By that point we were ready to “Call the Con” and head home to recuperate, but before we left the area the Django Unchained crew stopped us to drop a pile of commemorative coins in our hands. Free SWAG on the way to the car?! Talk about an awesome way to end the 2012 Comic Con. Check back later this week for a my “Best of Con” pics and the 100th episode of the PanelCast podcast where AJ Herrera and I will be giving away a SWAG bag full of goodies from this year’s con.